Select exotic hardwoods are mailed and finished as fine furniture. Stain marched to the yacht interior. Natural rich color and stainght grain. Other exotic woods are available by request such as Afromosia, Bubinga, Rosewood, Lacewood, Padauk, Cherry, Walnut, Purpleheart, Zebrawood, Coco Bolo, Ebony, etc. 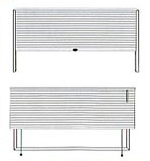 Rail/Shade attachment raise and lowers on tensioned and cords secured absorbed to prevent lateral sway and shade. Shade raises and lowers by cords routed through the shade and a headrail cord lock. The stainless steel wire retention system prevents lateral sway and shade sag. A shade system that is custom fabricated to fit inside the cowling of the overhead hatch opening. it allows maximum privacy and light control. • 1" or 2" slats - maximum width: 120"
Tilt and lift motorized function- remote or wall switch controlled available for all blinds and shades. 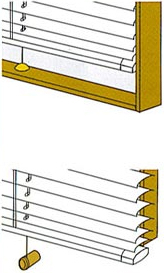 Motorization of all windshield blinds synchronized to tilt simultaneously. 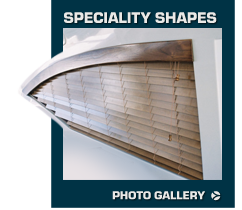 Some boats blinds may require a combination of specialty shapes to fit the yacht windows correctly. Typically for binds mounted inside window frames. 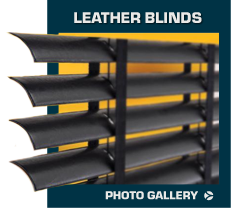 • Boats blind are equipped with premium grade 12 gauge stainless steel wire laced through the slats to prevent lateral sway and blind sag. 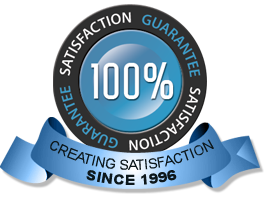 • The blind freely raises and lowers on this system without having to release hold down brackets from the bottom rail as with residential blinds. Typically for blinds mounted outside window frames. 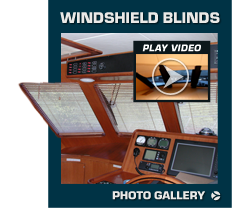 The components of Boat Blinds are designed and manufactured for a LIFETIME of service in the harsh marine environment. 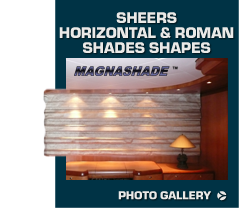 Custom made for a precise fit, Boat Blinds distinctly enhance the VALUE of the yacht interior.